You are cordially invited to take part in the Second Annual Quarry Lane School Womxn’s Invitational at The Quarry Lane School in Dublin, CA. This event will take place on Saturday, February 23rd and includes Lincoln Douglas and Public Forum debate. We will be using the January/February NSDA topic for LD (TOC topic) and the February NSDA topic for PF. We welcome all competitors who identify as being a womxn to combat marginalization in the debate space. If you would like to donate to our cause, please use the following link. Thank you to any and all of you for any donations -- we sincerely and greatly appreciate your support that makes this possible. Have you ever felt small? Powerless? Like the majority of people are against you? Do you ever feel marginalized by the boys in the room who at times seek to “put you in your place?” Speech & Debate is for everyone, but it doesn’t always feel that way. The ability to attend debates, practice, and succeed all depend on your support group, and too many times, these support groups don’t include people who identify as anything other than boys. We want to help change that. 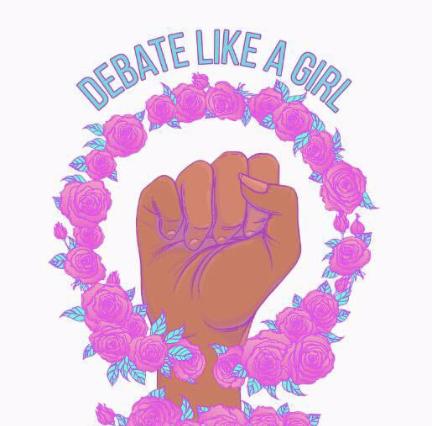 By developing a womxn’s tournament, our goal is to get more womxn involved in all aspects of debate: prep groups, practices, debating, judging, coaching, and running Tabroom. If you can relate to being under-represented in debate, you can show the debate world what it’s missing out on. We, a small school, hope to overcome the challenges womxn face on a regular basis one step at a time by creating an empowering environment in which womxn compete against each other in a productive and educational manner while being judged by womxn. Even the tournament will be run by womxn! Our tournament will begin with a day-long round-robin style tournament (Saturday, February 23rd) where competitors will be put into pods depending on interest. The following day will see the round robin participants helping to judge less experienced participants in a regular formatted all-womxn tournament. *For our purposes, all femme/female identifying individuals, and those that experience marginalization because of their gender in debate, are welcome. Elsewhere where you see "girls," we are referring to all those identities for the sake of simplicity. NOTE: You MUST provide trigger warnings to students and judges before rounds. This is NON-NEGOTIABLE and we WILL NOT TOLERATE anyone who triggers a student or judge during a round without providing them a trigger warning prior to that round. Please do not hesitate to bring any issues to your judges or to tabroom directly because we are here to ensure that this is a safe and accessible space for everyone. Do I have to be a womxn or girl to attend? Are you policing this? The short answer is if you identify with the statements above, and you navigate debate and the world at large as a feminine-identifying or ID'd person, then this tournament is for you. If that is not your experience, it would not be. Male students, chaperones, and adults are welcome to support, but are not invited to join the forum. Why are men not allowed to participate in the panel discussion? Are we man haters? Nearly the entire world is open to men. They have access to spaces and power that many of us never can enjoy. The conversation and experience is entirely different with them in the space. The point is to carve out a safe place for discussion and networking and to provide a much needed place where we can be the dominant voice for once in debate. We hope you understand that while we don't hate men, there are times when their voices are counterproductive, and this is one of them. Can I just come and observe? Can I just come and be a part of the networking and forum as an adult? Absolutely, and absolutely! We would be honored to have you join us. *We will speed up rounds if possible. To encourage participation from all debaters, we are offering the option of submitting a low-income waiver. Please email eshah@quarrylane.org if you wish to apply. All judges are obligated through the semi-final round in LD and PF, and also one round past the school’s elimination. For example, if your school’s last LD student is eliminated in R4, your LD judges must be available to judge the LD semi-final round. We don’t want to be short on judges towards the end of the tournament, so we greatly appreciate any volunteers willing to stick around for elimination rounds. We will be providing hired judging for a fee of $50. We do however earnestly hope that volunteers, as well as round robin participants, will help to judge and provide feedback to young womxn. Please email eshah@quarrylane.org if you’re interested in being a part of a pool of womxn that can help judge. We will be offering lunch on both Saturday and Sunday for all debaters. Snacks will be available for purchase in between rounds. Please let us know if you have any vegans in your group so that we order the appropriate amount of veggie-friendly food. Please also note any other special dietary restrictions such as food allergies so we can make sure that everyone is accommodated. Both are close to the Quarry Lane campus (~3 miles).